Do you like lemons? I sure do! 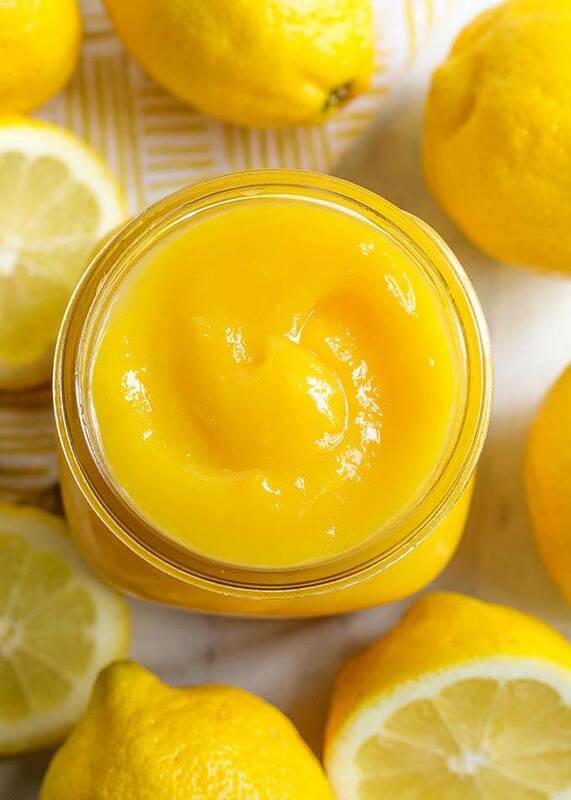 If you have never had Instant Pot Lemon Curd, you are in for a treat This is an easy pressure cooker lemon curd recipe, and the results are amazing! 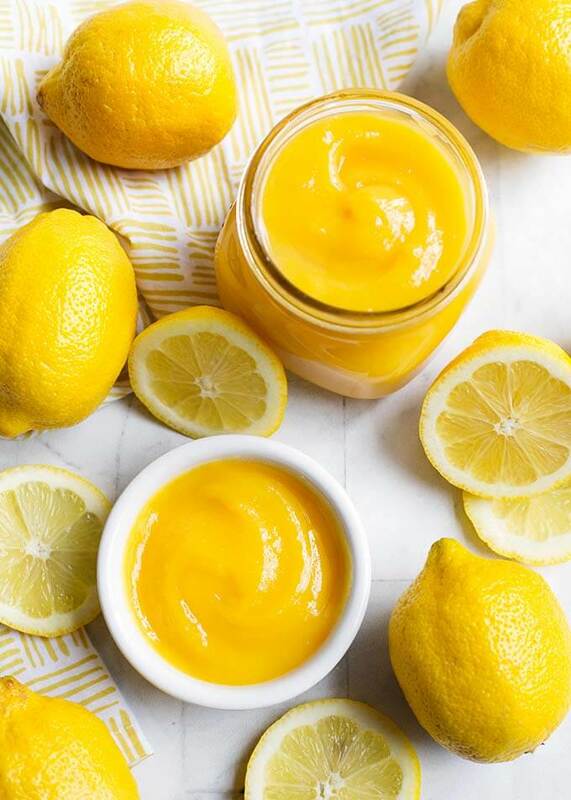 Lemon curd is a tart-sweet custard type confection, and is a wonderful topping on yogurt, cheesecake, toast, pastry, and much more. I think lemons are the best citrus fruit! Their bright scent and pretty yellow color makes me happy! You can do so much with lemons, like make cleaners, essential oil, wood polish, and of course, there are a ton of food recipes that lemons are the star of! Instant Pot Lemon Curd is one of those recipes, and it’s delicious and super easy to make. My favorite cake filling is lemon curd. And on yogurt, lemon curd is divine! Many people don’t know how easy it is to make. You can make it on the stove, in the microwave, and in your Instant Pot! 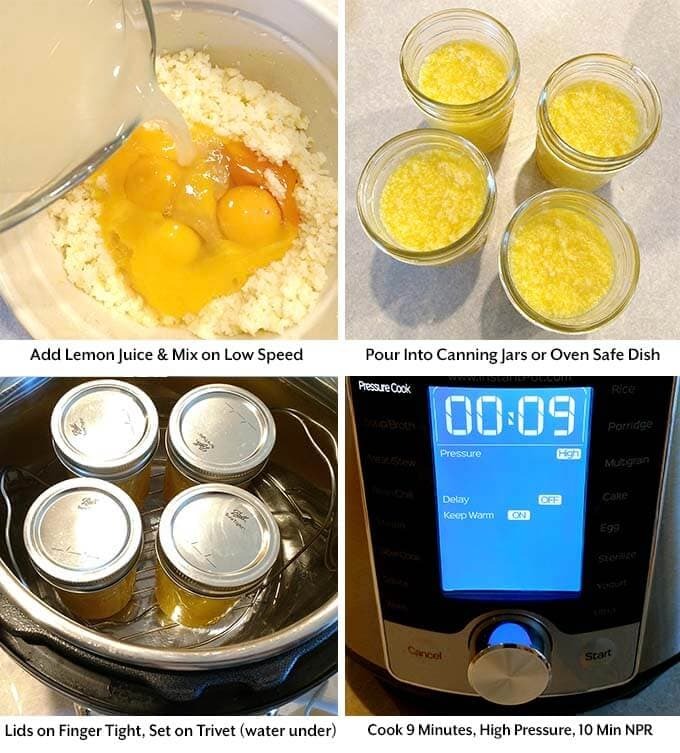 Instant Pot Lemon Curd is a delicious confection made with lemons , eggs, and butter. It is so delicious, and is great on cheesecakes, pastries, yogurt, toast, and as filling for cakes, pies, etc. Pour 2 cups of water into the inner liner stainless pot. Place the trivet/rack in the pot. Add the Zest of the lemons (careful not to get any of the white pith, you just want the yellow part) and put zest in a mixing bowl. Juice as many of the lemons as you need to get 1 cup of lemon juice. Set juice aside. 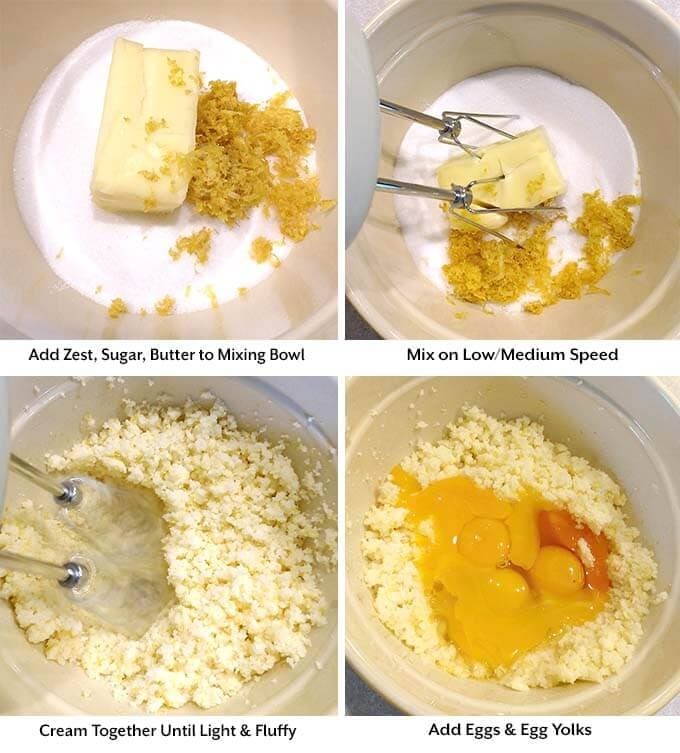 Add the sugar and butter to the mixing bowl with the zest, and cream together, using a hand mixer, until light and fluffy. Add the eggs, egg yolks, and lemon juice to the butter mixture and mix on low speed until combined (it will be lumpy from the butter). Pour into 1 cup or pint mason canning jars and put the lids on finger tight. Don't fill more than 3/4 full as the mixture will "rise" as it cooks (it does come back down when you stir it). Place the jars on the trivet in the pot. Place the lid on the pot and set the steam release knob to the sealing position. Press the Pressure Cook/Manual button or dial, then the + or - button or dial to select 9 minutes. After the cook time has finished, let the pot sit undisturbed for 10 minutes (10 minute Natural Release). Then turn the steam release knob to the Venting position and release any remaining steam/pressure. When the pin in the lid drops down, open the lid and very carefully remove the hot jars of curd. Use an oven mitt, or a canning jar retriever. Be very careful! Set the jars on a surface that can withstand the heat. Carefully open one of the jars and stir the lemon curd with a fork or very small whisk until it comes together and is creamy. 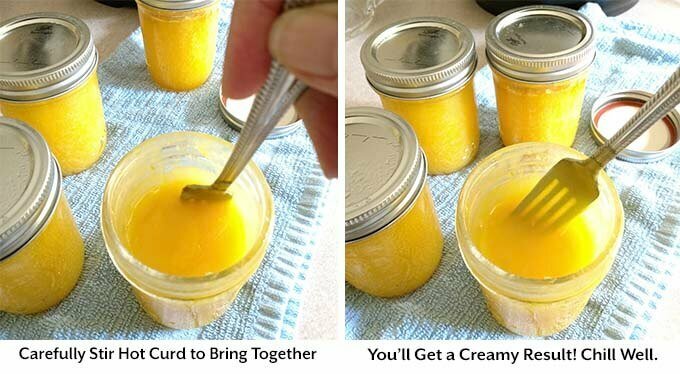 Repeat with remaining jars of lemon curd. If there are any small lumps that you don't want in there, you can strain it into a bowl and refill the jars, or transfer to a container of your choice (though this has never happened to me). Let cool for about 15 more minutes, then put in the fridge for a few hours to chill and firm up. 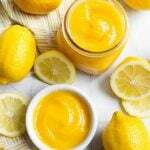 Serve this delicious lemon curd on yogurt, toast, cheesecake, pastry, cakes, muffins, or just eat it by the spoonful! If you are going to use this lemon curd as a cake filling, add 1 1/2 Tbsp of corn starch to the mixture when you add the eggs. This will help it stay on the cake layer. Oh my goodness this stuff is dangerously good! I wasn’t sure about it when I opened the first jar because it looked like it had separated, but when I stirred it up it got all smooth and creamy. Whew! The taste is fabulous! I will be making this often to go on my morning yogurt! Ha ha, I know, it does look like a mistake when you first open it. That’s just the melted butter. That’s the reason you need to stir it while it is still hot, then it comes together perfectly! I’m so glad you like it! Thank you for your review! That’s great, Teale! I have had people ask me about a sugar substitute, and I’m glad it worked for you! Thank you for your review! Does the zest disappear into the curd? When I’ve made lemon curd via stovetop, I’ve always strained it out. Hoi Jeanne, yes, it does for me. I use a microplane zester so the pieces are very small. Thanks for the reply, I’m very excited to try it! How long will this keep in the refrigerator and also can this be frozen…. Hi Lana, I keep mine in the fridge a few weeks. Yes, it can be frozen! Just thaw it in the fridge about 1 day before you are going to use it. Help. I just made lemon curd but my ball jars have 2 part lids. Even though the outer ring wasn’t tight the flat lid is stunk on where I can’t open jar to stir. What do I do? Just pry it off when it cools enough to touch. Then stir the curd really well. You may need to warm it. I have had this happen, too. Can I do it without individual containers? You can try making it in an oven safe dish, but it’s best if it has a lid. Not directly in the pot. At least I haven’t tried that. Can you use lemon juice from the bottle? I’m not sure. Maybe try it with a half batch and see if you like the flavor? So glad you liked this lemon curd recipe, Denise! Also, lemon filled donuts are amazing! I could see getting some powdered sugar donuts and dipping them in this! How much does this make? How many jars? Sounds yummy! Hi Kim, this recipe yields 3 to 4 cups. I am English and love my Lemon cured, and home made is a must in my lemon cake recipe! This is the first recipe I made in my insta-pot and it turned out perfectly! Just the right amount of tart and sweet! Thank you! Thank you, Joanne! I’m so happy you like it!